SAN FRANCISCO, CA--(Marketwired - Nov 4, 2016) - DroneDeploy, the leading cloud-based drone software platform, announced today at the inaugural DroneDeploy Conference the launch of the App Market, the first drone industry app store. The new DroneDeploy App Market launched with more than 15 inaugural apps, and offers third-party developers access to the largest dataset in the world of drone 2D maps and 3D models, to help solve business challenges. "Businesses have been asking for a more seamless integration of drone data into their workflows, and third-parties have been looking to develop solutions for our global community," said Mike Winn, CEO and co-founder of DroneDeploy. "The DroneDeploy App Market offers one-click integrations with companies like Box and John Deere, a huge step in enabling commercial drone users." The introduction of the App Market on the DroneDeploy platform creates a one-stop shop for all aspects of cloud-based drone data analysis. Users can now extend the power of DroneDeploy by leveraging third-party apps within their DroneDeploy interface on the web and mobile devices (iOS and Android). "We're really excited to be a part of the growing drone ecosystem," stated Ross McKegney, Platform Director at Box. "Our partnership with DroneDeploy enables us to help our customers better leverage drone data for their business." According to PwC, the emerging global market for businesses using drones is expected to top $127 billion by 2020. One company that has benefited from the drone industry's exponential growth is FAA Part 107 certified drone service provider company, Bon Air Drone. As a result of its emphasis on accuracy, in just over a year the company has grown to four locations and has been awarded large contracts in the mining and surveying industries. "As a daily user of DroneDeploy for aerial imagery, I'm very excited to see the launch of the app store and all the new applications," said Shelly Engel, co-owner of Bon Air Drone. "Their customizable platform is a real game changer in the drone industry." DroneDeploy's 10,000+ users across 135 countries have mapped over 8 million acres, larger than the country of Belgium, creating the world's largest dataset of drone maps and 3D models. For the first time in the commercial drone industry, developers will monetize and easily distribute their apps within a drone data platform. Third-party, integrated apps will accelerate innovation within the industry. The inaugural apps enable: file sharing with Box, importing field boundaries from MyJohnDeere, exporting data to Autodesk, 3D printing of drone maps with WhiteClouds, on-demand flight insurance with Verifly and more. Other apps include a flight compliance app from AirMap; a roof inspection app from EZ3D; flight logging apps from DroneLogbook, Flyte, Kittyhawk, NVdrones and Skyward; and agriculture apps from Aglytix, AgriSens, Birds.ai, Skymatics, SLANTRANGE and TensorFlight. According to Nicholas Pilkington, DroneDeploy's CTO and co-founder, "Until now, DroneDeploy has focused primarily on solving core challenges in the drone space around flight, data collection, processing and analysis. Now we are opening up our stack so that developers can use these technologies themselves, and can focus on building specific solutions within their domain expertise without having to reinvent the wheel." Full developer documentation for companies wanting to leverage DroneDeploy APIs to build and distribute apps can be found here. 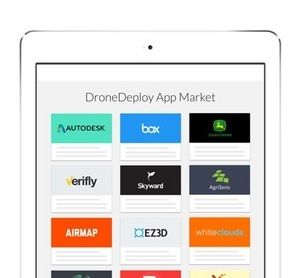 The DroneDeploy App Market features free and paid apps. Pricing models for paid apps vary upon the app, from per acre for agriculture apps to per report for roof inspection apps. Once added to an account, the new app will appear integrated within the relevant location within the DroneDeploy interface on the web and mobile. For example, if an agriculture app is installed, it may only be visible when viewing the Plant Health data layer and not within other sections of the DroneDeploy interface. To see the full list of new apps visit the DroneDeploy App Market. To learn more about today's announcement visit the DroneDeploy blog. DroneDeploy is the leading cloud software platform for commercial drones, and is making the power of aerial data accessible and productive for everyone. Trusted by leading brands globally, DroneDeploy is transforming the way businesses leverage drones and aerial data across industries, including agriculture, construction, mining, inspection and surveying. Simple by design, DroneDeploy enables professional-grade imagery and analysis, 3D modeling and more from any drone on any device. DroneDeploy users have mapped and analyzed over 8 million acres in over 135 countries. DroneDeploy is located in the heart of San Francisco. To learn more visit www.dronedeploy.com and join the conversation on Twitter @DroneDeploy.